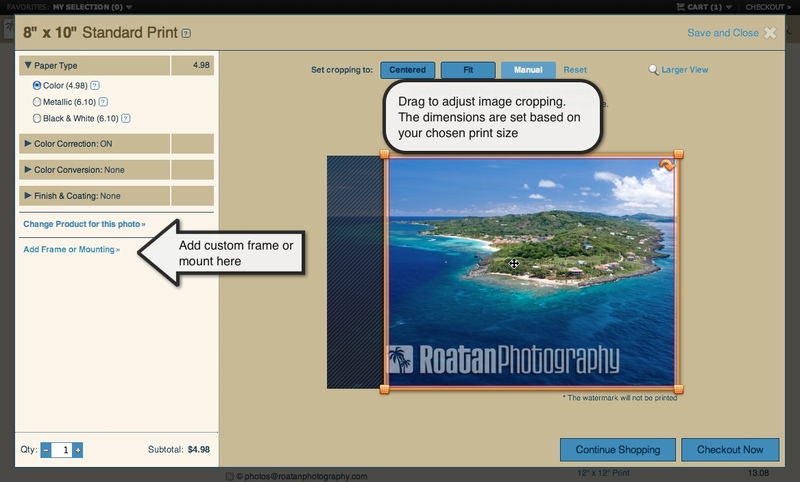 Ordering prints from Roatan Photography and having them shipped to your door is now easy with our online ordering software. We provide prints in a variety of standard sizes, large canvas gallery wraps ready to hang on your wall, custom framing and matting, and we even provide specialty items such as keychains, mousepads, and mugs. Prints are availble from our photo gallery, or from your wedding or other event. The following guide will help you through the process of ordering your prints. You can view photos at prints.roatanphotography.com or by following the link for your specific event. Once you have found the image that catches your eye, select Buy. 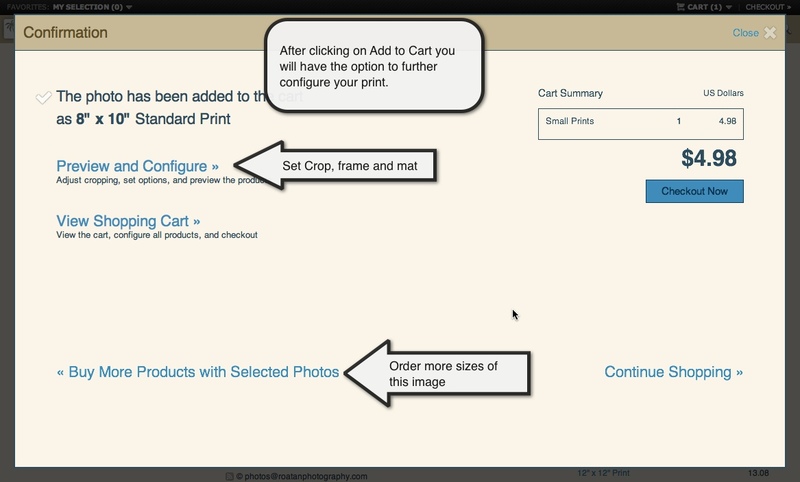 In the pull down menu, choose Save for purchasing later to add to your cart, continue browsing images, and choose print options later. 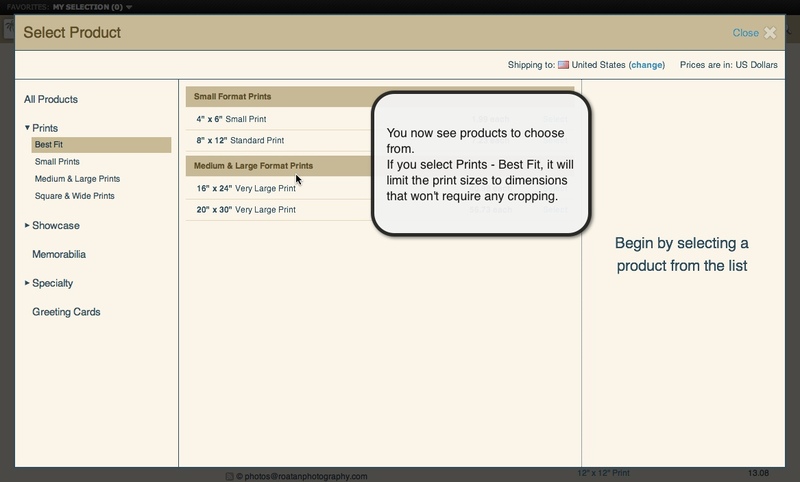 Or, choose Select Product to add to your cart and choose printing options now. After choosing Select Product, you will be presented with a selection of products to choose from. If you select Prints – Best Fit, it will limit the print sizes to dimensions that won’t require any cropping. 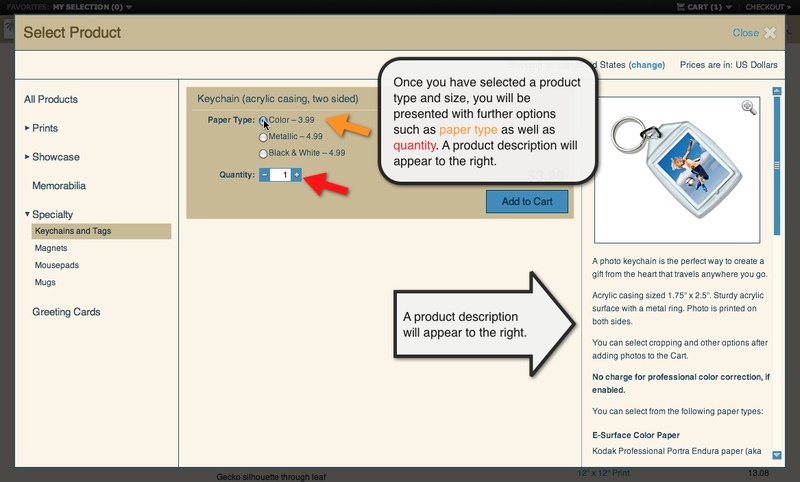 Once you have selected a product type and size, you will be presented with further options such as paper type as well as quantity. A product description will appear to the right. 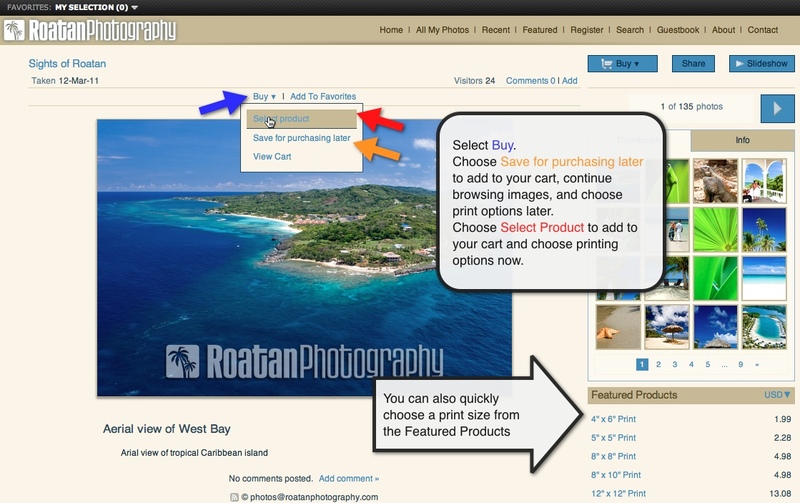 You can now either continue browsing images, or or further customize your print with cropping and framing options. 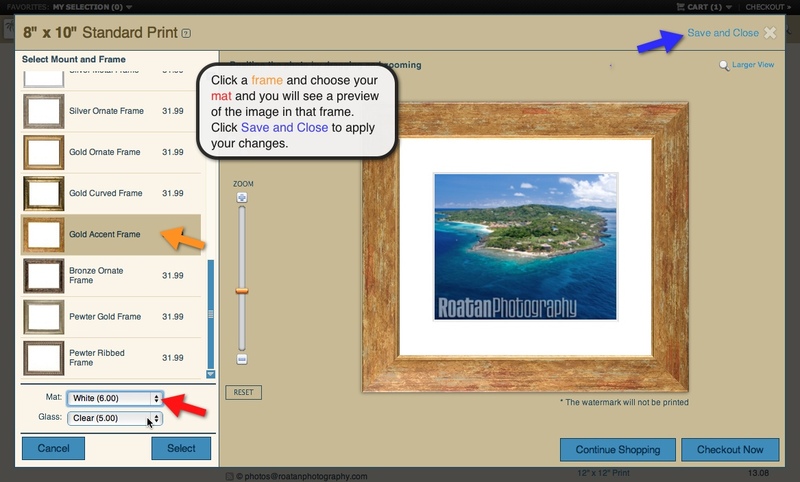 Click Preview and Configure to choose a custom frame or to crop the image. To crop the image, just drag the crop tool over the image to adjust your crop. Note the size ratio is determined by the size print you selected. If you select outside the image area, you will be warned that the white area will be printed. To add a custom frame, mat, or to mount your print, click Add Frame or Mounting. You will see a number of metal and wood frames on the left to choose from. Select a frame and it will show a preview on the right. Once you have selected a frame, you also have the option of a black or white mat around the image and glass type. We recommend non-glare glass for best viewing. Click Save and Close to add to your shopping cart and continue browsing, or click checkout now to order your print. If you were provided a discount or coupon code for your event, you will have a chance to enter it when you check out.